Location: At the end of a short approach road running east from the junction of two un-named minor roads. Present state: The two platforms still exist but have been buried. The goods warehouse and road bridge to the south-west of the station are extant. The Railway Inn has some railway memorabilia on display. 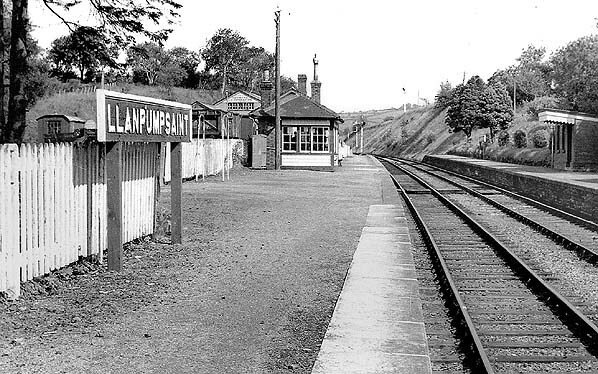 Notes: Llanpumpsaint station is ⅓ -mile north-west of the village of the same name which, in 2001, had a population of 595. With the coming of the railway a small community built up around the station and the Railway Inn. The village name – official spelling Llanpumsaint - means ‘church of five saints’. Ordnance Survey large scale maps mistakenly used the official spelling rather than the railway version of the name when identifying the station. waiting room. There were two other buildings on the platform. One was probably the gents' toilet, and next to it was a small corrugated iron building with double doors which was a parcels store. On the opposite platform there was a waiting shelter with a sloping roof which extended over the platform to form a canopy. There was one running-in board on each platform, but there were no other station signs. After closure to passengers in 1965, the loop was lifted. After complete closure of the line in 1973 the remaining track was lifted in late 1975 or early 1976. Shortly afterwards, the trackbed between Abergwili Junction and a point just short of Llanpumpsaint was sold to the Gwili Steam Railway. 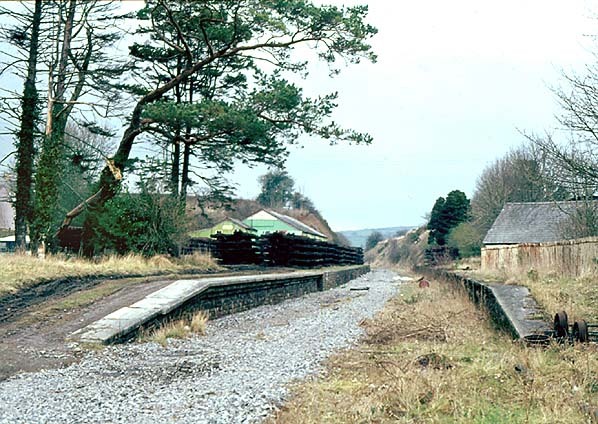 The Gwili Railway has a long term ambition to reinstate services from its current northern terminus at Danycoed Halt to Llanpumpsaint, but the extension south to Carmarthen is the priority. There are three bridges over the River Gwili between Danycoed and Conwil and a further four between Conwil and Llanpumpsaint that require expensive repairs, so the extension to Conwil is still some years away, and northward to Llanpumpsaint is a project for the more distant future. After closure of the line the Carmarthen and Llanpumpsaint Farmers' Co-operative took over the goods warehouse. 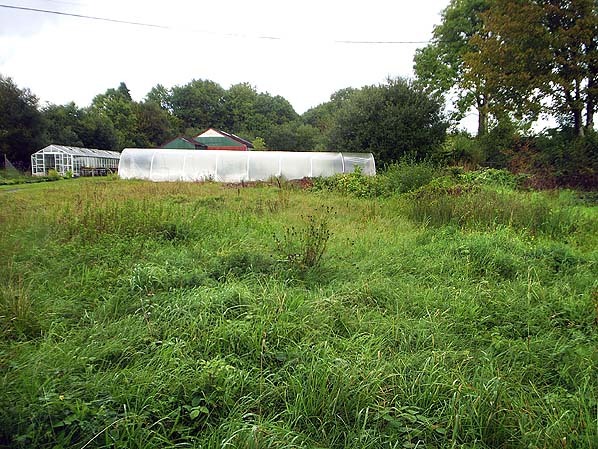 The station site is now owned by Carmarthen County Council and is leased to a market garden. The road bridge is also owned by the council; the Gwili Steam Railway's property ends at the bridge. If the station site ever comes on the market the GSR will be given first refusal. One of the metal platform huts was acquired by a local farm, it is believed that this hut, now altered, is the new parcels shed at Bronwydd Arms. 1906 1:2,500 OS map. There is little difference between the two maps apart from two small buildings that are now shown in the goods yard, both of which can be seen in the photo below. The large goods warehouse shown in some of the photographs below has not yet been built. A second short siding is seen to the south of the station. 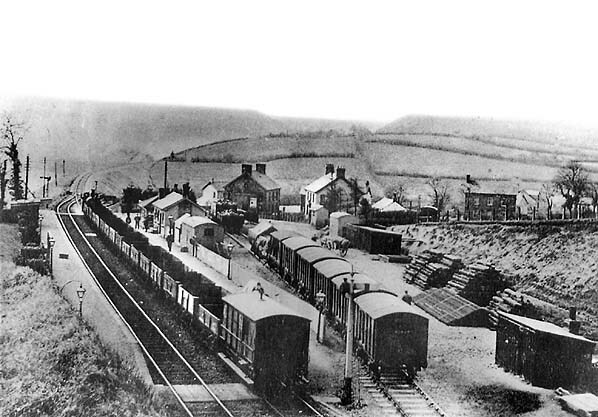 Another early 20th century view of the station and goods yard; the short siding to the south of the station is clearly visible in this view. The station handled large quantities of timber. 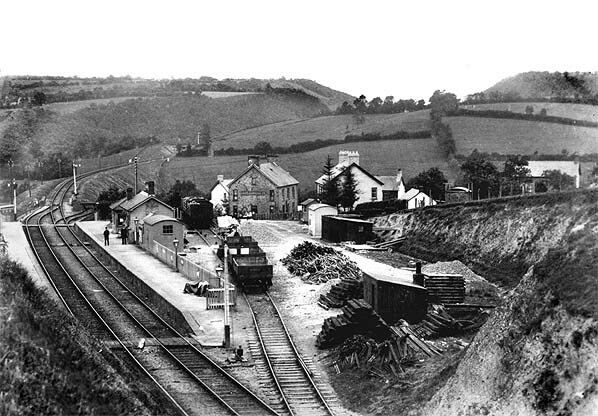 Llanpumpsaint station looking north-east from the down platform in 1947. The station signal box is seen on the platform opposite the waiting shelter. A goods warehouse, not seen in the photos above, can be seen at the north end of the goods yard behind the station building. 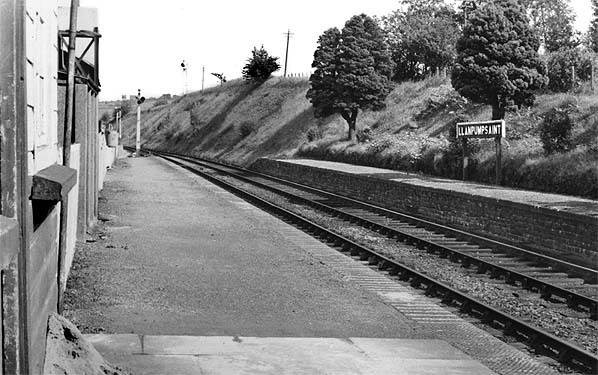 Llanpumpsaint station looking north-east from the down platform c 1960s. The parcels store is visible beyond the station building. After closure one of the two running-in boards was displayed outside the Railway Inn for many years. 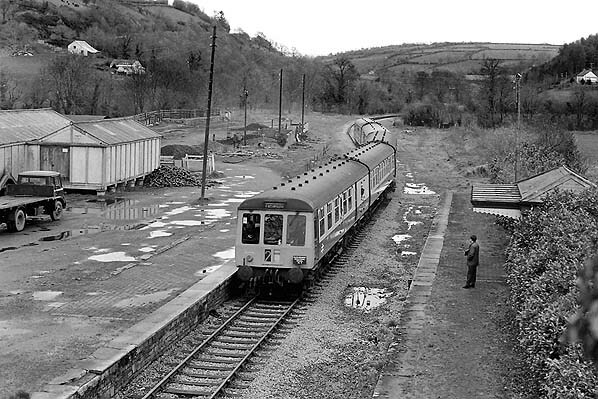 A Carmarthen to Aberystwyth train waits in the down platform of Llanpumpsaint station in the 1960s. 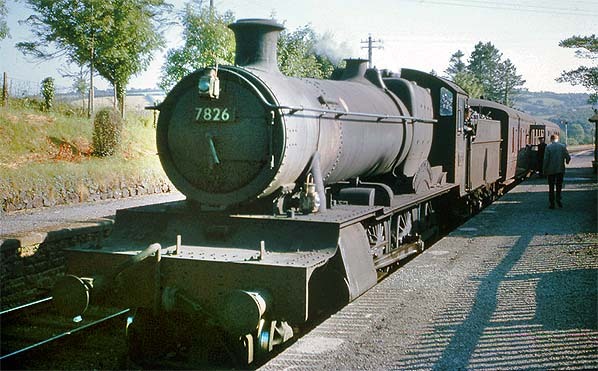 7826 was built at Swindon works by British Railways in December 1950 to the C.B.Collett Manor design of the GWR. Named 'Longworth Manor', this 4-6-0 was one of a class of 30 and had a working life of less than 15 years, being withdrawn from Cardiff East Dock shed in April 1965 and cut up at Birds of Bynea (Carmarthenshire) in July of that year. The Gilks-Grenside (Educational Special Numbers 7 & 8) railtour arrives at Llanpumpsaint station on 25 April 1970. Although the goods yard closed to rail traffic on 2 December 1963 the coal depot remained open for road traffic as can be seen in this view. 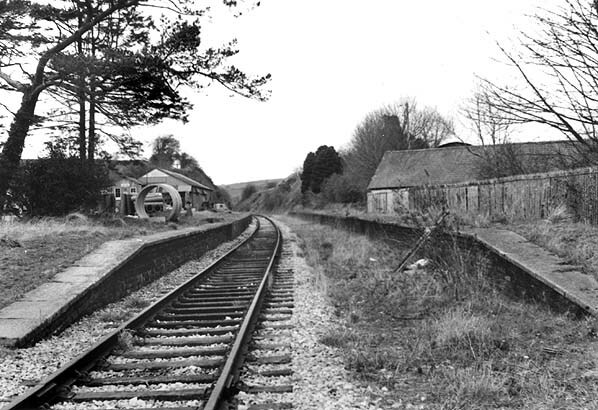 Llanpumpsaint station looking north-east in April 1975. All the platform buildings have been demolished, but the buildings in the goods yard are still standing. The Carmarthen and Llanpumpsaint Farmers’ Co-operative took over the goods warehouse after the line closed; it is still standing. The station site is now owned by Carmarthen County Council and is leased to a market garden. 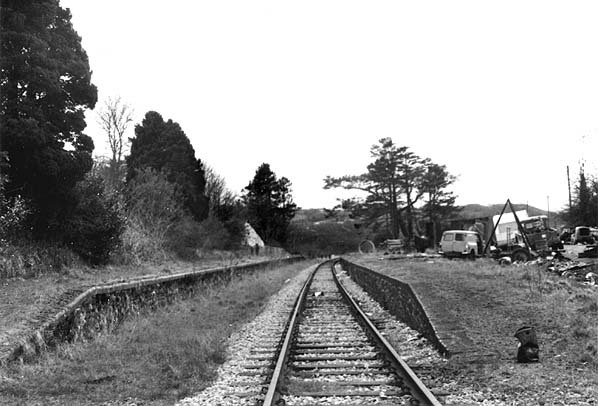 Llanpumpsaint station looking north-east in February 1976, shortly after the track was lifted. The site of Llanpumpsaint station looking north-east in September 2010 taken from a similar viewpoint to the picture above. The platforms have been buried. The goods warehouse can still be seen in the background.